In stock and shipping, but with limited inventory. Now in stock and shipping. This Behmor Plus Upgrade Kit will enable you to convert your existing Behmor 1600 into a Behmor 1600 Plus. The Behmor 1600 Plus roaster is being introduced into the US market in late summer 2014 and the only changes between it and its predecessor, which it will replace, is a new Control Board (aka PCB) that will provide additional roasting controls and information. 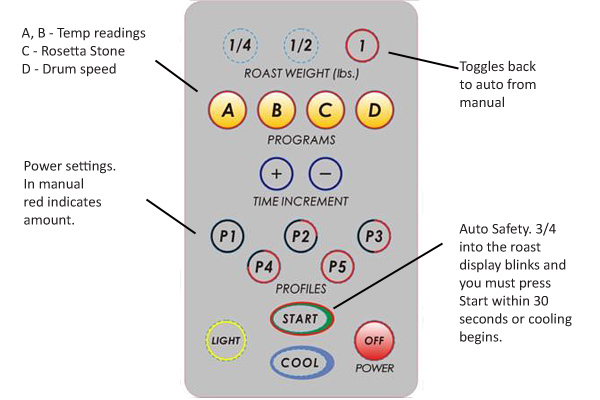 The PCB will allow home roasters to switch between the original automatic profiles and new manual settings. Users will be able to read thermistor and exhaust temperatures and also switch between two drum speeds. We will be selling the Behmor 1600 Plus for $369 ($399 MSRP) but this upgrade kit at $49.95 coupled with your existing 1600 roaster will equal less. However, you will need to do the conversion yourself, a fairly simple and straightforward process if you are at all handy. Instructions are included and will also be available here shortly, so that you can see what steps are required. Do you need to upgrade? If you have an existing Behmor 1600, you are happy with it and see no need to have manual overrides, than there is no need to upgrade by purchasing this upgrade kit or even a new roaster. You can continue to use the 1600 Plus just as did the 1600 when in its automatic (standard) mode. There are no other differences between these models. All the time: Auto or Manual 1) Press C (for crack as in first) and it resets timer according to weight to our �Rosetta Stone� times which are associated with approximate time it takes to go from the first crack of 1C to start of 2C. It is merely an approximation. 2) Auto Safe/ Unattended Switch � at 75% into set time of a roast the timer will start blinking un:30..29, 28 etc. The user has 30 seconds to press START otherwise it will automatically go into cool flashing err7. Recap In Auto (default) all buttons act the same as in current system except ABC, for temp readings and time reset. In Manual (only functional after starting a roast) Button 1: Returns system from Manual mode to Auto (defaults). 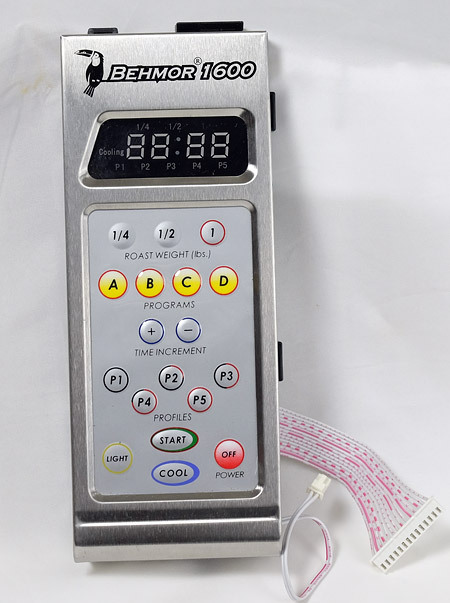 Buttons A - C same as in auto Button D - drum / cylinder motor speed toggle from standard (8 rpm) to high (16rpm) Buttons P1 - P5 power to elements: P1- 0, P2-25%, P3-50%, P4-75%, P5-100% All other buttons �, �, +, -, Cooling, Light, Off remain the same in either / original program. Front panel replacement instructions from Behmor.